Super Savings Item! 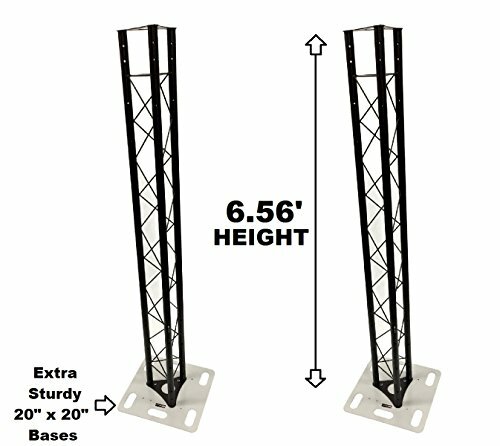 Save 36% on the Two (2) Totem 2 meter 6.56ft Black Triangle Metal Truss Tower + 20''x20'' Base Vertical System by Cedarslink at IGWT. Hurry! Limited time offer. Offer valid only while supplies last. This tower truss system is your perfect solution for stage lighting! The triangle truss connects to the bottom base with ease using the included bolts. Extremely strong and sturdy design. Place an up-light inside to create dramatic effects, or use them to hang TV's, Stage Lighting and other accessories. Two 6.56' metal triangle truss sections. Triangle truss tubes are 1.5" diameter.